I got the chance to back to Da Nang and Hoi An early this month and as usual, the taste of central food never disappoints me. For somebody who never been to Da Nang and Hoi An before, I hope you can try these dishes when having chance to visit the lovely destinations. Those who had the chance to tase these dishes, I hope my photos reminds you a bit about not about the food, but also about the beautiful memories during your Vietnam tour packages. cities in Vietnam, centrally-controlled and have the advantages about infrastructure, science and technology development, higher education, large population and convenient transportation). Fortunately, the taste of the special dish never changes and now we can enjoy the authentic My Quang in many local restaurants in Da Nang. The main ingredient of My Quang is the noodles. It is made from rice – fresh and smooth, similar to the Pho in Hanoi but the structure of the noodle is thicker. The original meat toppings have river shrimp, boiled eggs, pork, adding fresh herbs (spring onion, corianders and basil) and roasted peanuts. Some restaurants have the menu with fish or chicken instead of pork. 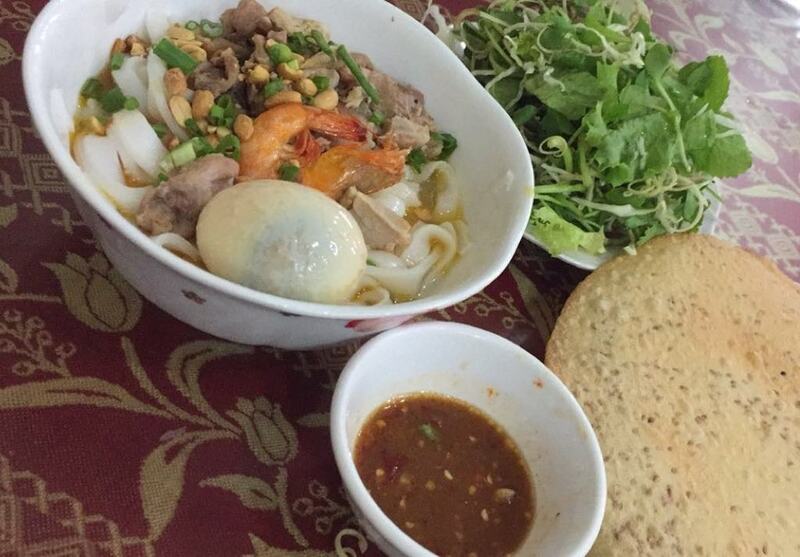 It is deserted with the special broth, but not like the other type of noodles with all the ingredients in the broth, just a bit of broth that suitable for the hot weather in Da Nang. The bowl is served with a dish of fresh vegetables from lettuce, sliced banana flowers, baby chrysanthemum greens and cress. A sesame rice cracker also served as a snack, or you can break to small pieces and mix it with the noodles. Optional to add chili or the special fish sauce for more flavor. Try a bite and it feels like a smooth dance of flavors in your mouth. There are many restaurants in town you can order this dish, but for me I tried it in Ba Mua restaurant near the Da Nang airport – Add: 95 Nguyen Tri Phuong street. Highly recommended with fast services, Good flavor and the many options on the menu, though the beverages is not really excellent (Sugar cane or passion fruit juice are suggested). The price is reasonable 30.000 VND per a bowl of My Quang. This dish brings to you the fresh and cool feeling in the summer. You probably know about the boiled spring rolls in many restaurants in Hanoi or Saigon, but here in Da Nang I bet you can have a truly different feeling about the spring rolls. This dish simply the boiled pork served with vegetables, rolled in the fresh rice paper and dip into the sauce. But the local chef knows how to turns the simple ingredients into a beautiful dish. The pork must be the belly with three parts: the lean meat, a bit of fat and the skin. It is boiled in water just in the right time, not overcooked cause it needs to be moist and tender. The boiled pork then cooled down and sliced, served on the plate. The vegetables that are served in this dish includes cucumber, pineapples, plantain – all julienned, along with the other herbs – corianders, mint, basils, etc. and lettuce. The most special thing of this dish is the sauce. It is made from the special fish sauce paste that can be found in Da Nang – Quang Nam, mixed with crushed chili, garlic and pineapple and lime juice. The smell might be quite strong at first, but the interesting part is waiting. When eating this dish, first step is put the dry rice paper on the plate, then spread a wet fresh rice paper, a slice of boiled pork, the other vegetables, roll them tight then dip in to the sauce. What a great combination and the fresh and cool feeling will help to blow away the heat in the summer. One tips for those who doesn’t like the pork skin and fat – you can special require the lean meat only, and replace the strong smell sauce by the normal fish sauce, but it is highly recommended to taste the authentic one like a local. The dish can be found in many restaurants in Da Nang and Hoi An. 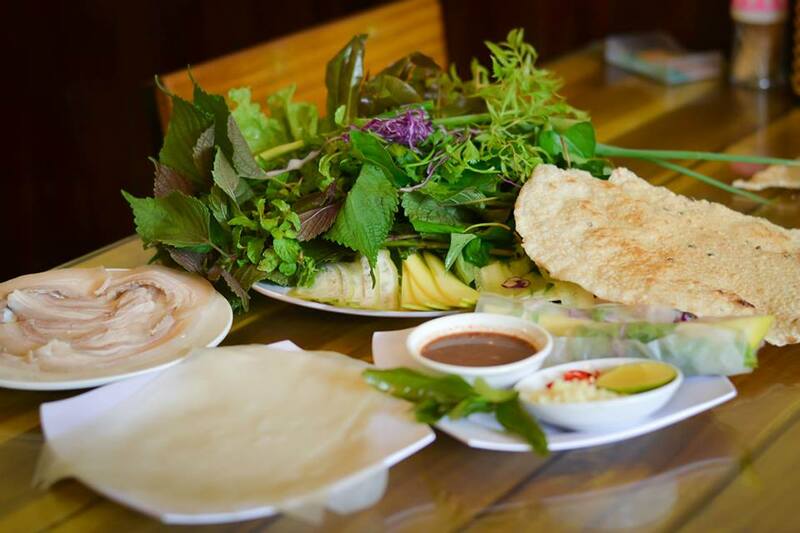 The address that is highly rated by the locals is the Quynh Dai Loc – 176 Nguyen Hoang, Nam Duong, Hai Chau, Da Nang. The dish named after the action people have to do before eating. Don’t worry because you don’t have to hit somebody to get the cake ;). It is the delicate combination between the fresh rice paper and the grilled rice paper, added onion oil (sliced onion fired in oil until yellow/brown and has special fragrance) in between. 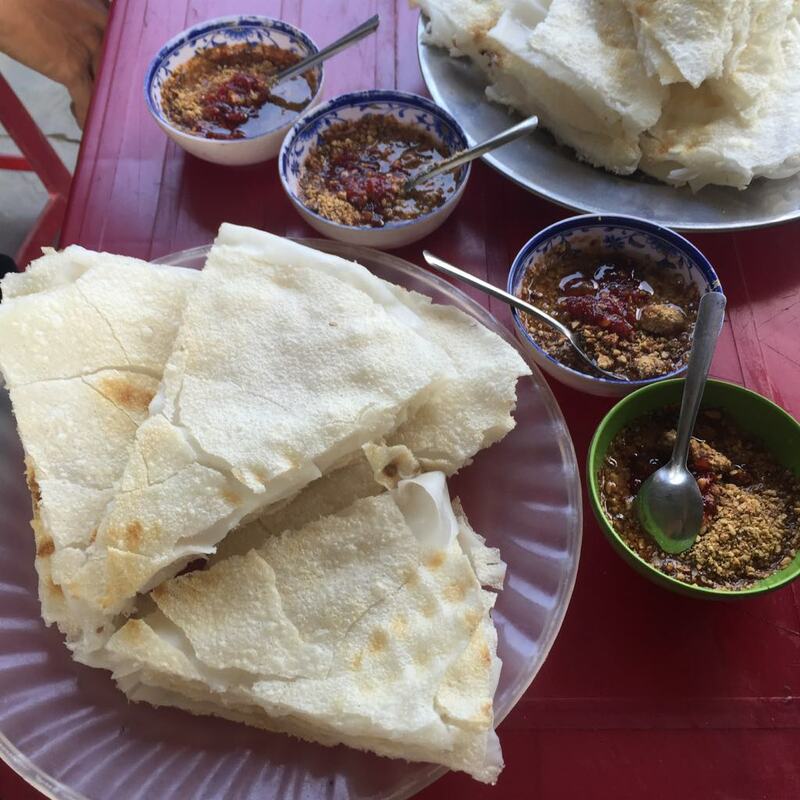 Before eating, you simply “hit” the cake vertically and slightly so the two type of rice paper stick together, then dip it in to the sauce made by the special fish sauce mixed with chili oil and roasted crashed peanuts. This is a simply dish and the local people eat it as a light snack. In a more luxurious version, it can be served with the BBQ pork or shrimp floss. Lucky me my friend took me to a very local restaurant (actually it is not a restaurant but just a family shop that sell one and only dish – Banh Dap) but it taste really good. Enjoy the peaceful view to the Ly Ly river, chatting with the friendly local aunt and take a short nap on the hammock, it must be one of the best moments during my trip. What are your favorite dishes? It would be great to hear your sharing.